I really didn't intend for this mani to turn into anything inspired by Tiffany & Co., but doesn't it feel like it? This is a BC and three coats of Essence The World's Coolest. A light blue/turquoise that leans more blue cream. There are no balls in the bottle but it shook up alright. I then added one coat of ULTA's Sugar Cookie from their Enchanted minis holiday set. I really think this is a dupe for China Glaze White Cap but haven't swatched them together. It's a sheer white shimmer with a gold flash. First shot indoors, second direct sunlight. I also had these adorable white bow accents that I added to my index fingers. 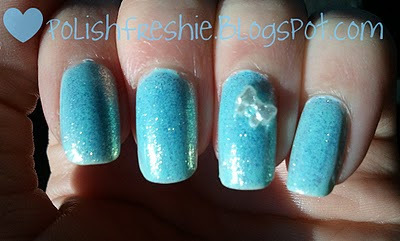 I used China Glaze Fast Forward as glue for the bows and as a topcoat for the entire mani. This didn't have tip wear until after five days or so. Very pretty! :) I LOVE the little white bows, so cute! That is too cute! <3 Five days! That's pretty darn good. I always get tip wear after like 2 days. Very pretty, I see the resemblance to Tiffany, as well as the name of the one polish, Sugar Cookie, this looks like the way I would ice a sugar cookie in winter, very sparkly and beautiful.